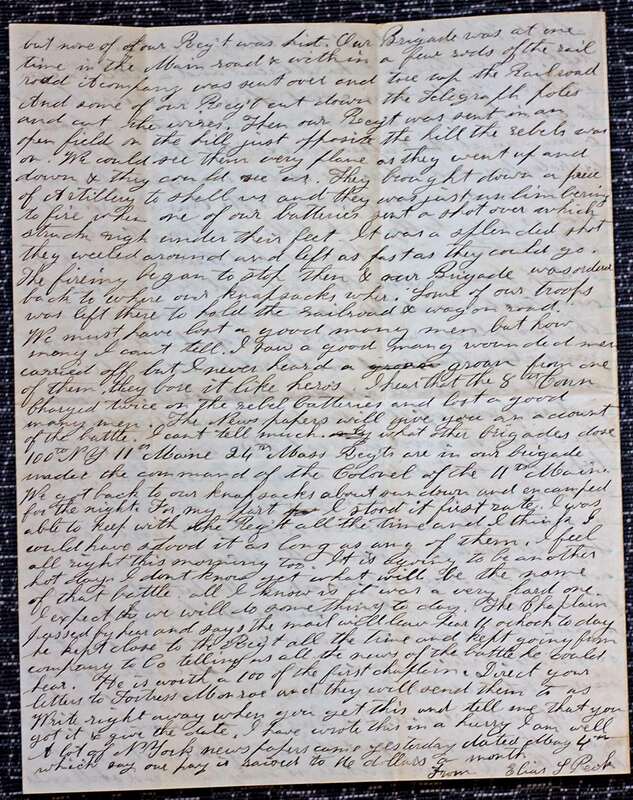 Editor’s Note: I would like to thank Chris Peck, the great grandson of Elias Peck, for granting me written permission to publish his ancestor’s letter. 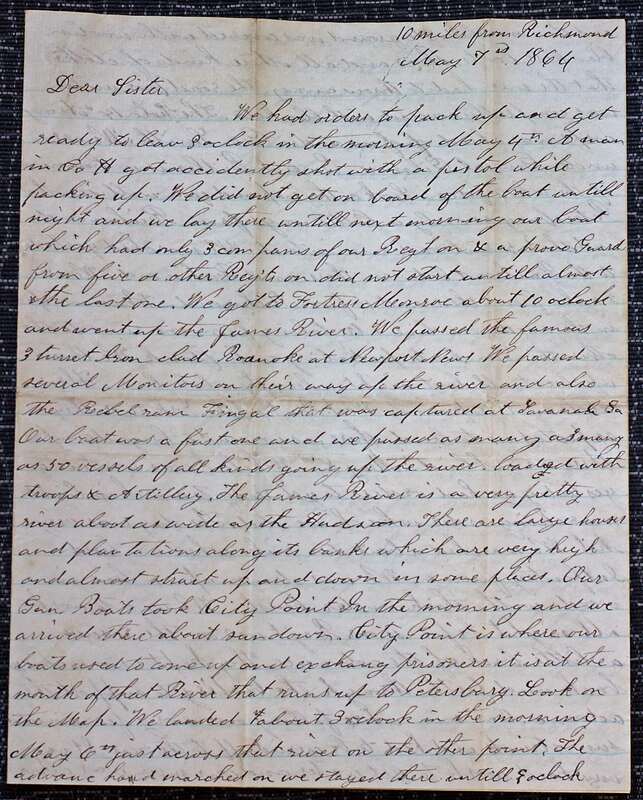 This letter is owned by Chris Peck and may not be reproduced without his written permission. All rights reserved. Chris is also the transcriber of this article. I added some comments and notes in brackets, but the rest of the transcription is due to Chris’ efforts. Elias Peck was a member of the 10th Connecticut, a regiment in the Tenth Corps, Army of the James which fought primarily on Bermuda Hundred and north of the James River during the Siege of Petersburg. but none of our reg’t was hit. Our brigade was at one time on the main road & within a few rods of the rail road it company was sent over and tore up the railroad and some of our reg’t cut down the telegraph poles and cut the wires. Then our reg’t was sent in an open field on the hill just opposite the hill the rebels was on. We could see them very plane as they went up and down & they could see us. They brought down a piece of artillery to shell us and they was just unlimbering to fire when one of our batteries sent a shot over which struck righ under their feet. It was a splended shot they weeled around and left as fast as they could go. 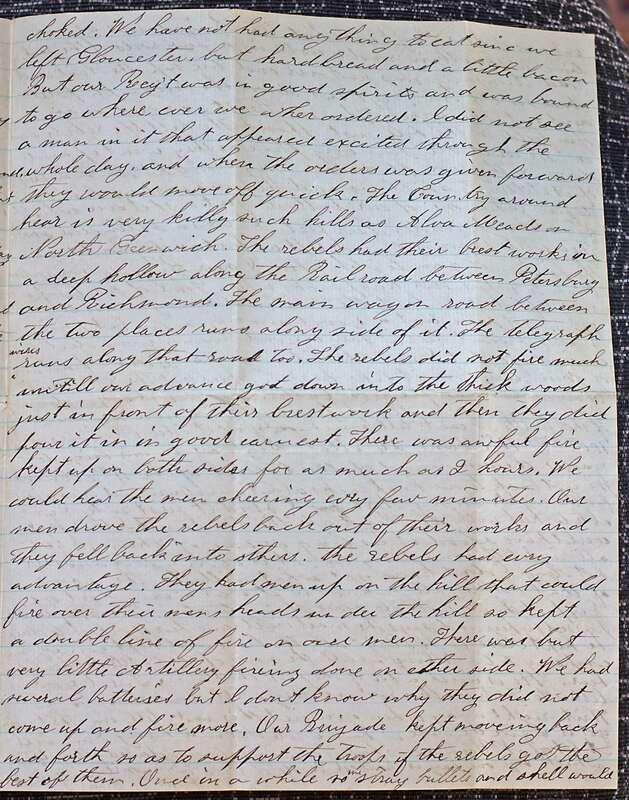 The fireing began to stop then & our brigade was ordered back to where our knapsacks wher.5 Some of our troops was left there to hold the railroad & wagon road. We must have lost a good many men but how many I cant tell. I saw a good many wounded men carried off but I never heard a groan form one of them they bore it like heros. I hear that the 8th [C]onn[ecticut] charged twice on the rebel batteries and lost a good many men. The newspapers will give you an account of the battle. 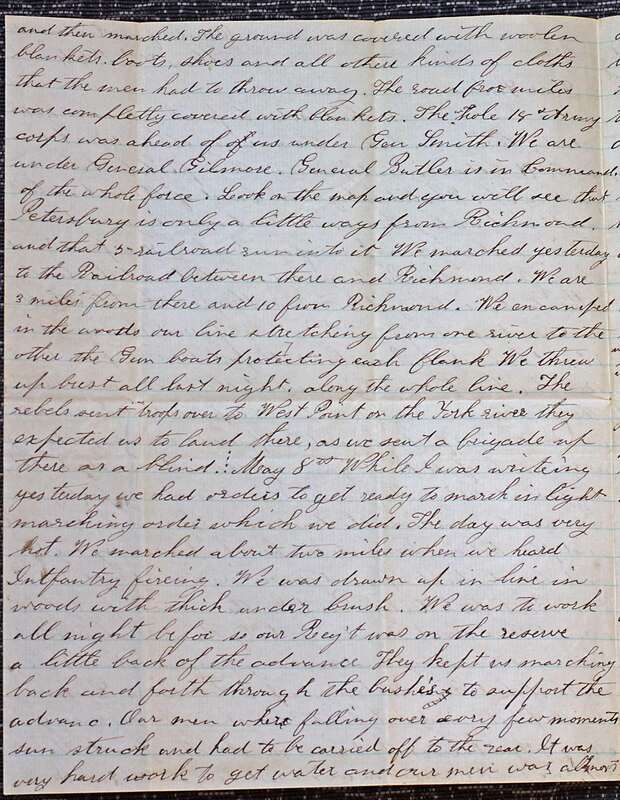 I cant tell much what other brigades dose 100th NY 11th Maine 24th Mass reg’t are in our brigade under the command of the colonel of the 11th Maine We got back to our knapsacks about sundown and encamped for the night. For my part I stood it first rate. I was able to keep with the reg’t all the time and I think I could have stood it as long as any of them. I feel all right this morning too. It is agoing to be another hot day. I dont know yet what will be the name of that battle. all I know is it was a very hard one. I expect we will do something today. The chaplain passed by hear. He is worth a 100 of the first chaplain. Direct your letters to Fortress Monroe and they will send them to us Write right away when you get this and tell me that you got it & give the date. I have wrote this in a hurry I am well A lot of NYork news papers came yesterday dated May 4th which say our pay is saved to 16 dollars a month.